Pickup Some Creativity: Sewing 101 with Tasha, Be brave. Sewing 101 with Tasha, Be brave. Today we welcome Tasha from Creation Corner. Tasha's theme for her blog is "a little bit of me and a little bit of you." She shares her creations, but also features others that she finds...she has a great eye. So, take it away Tasha. If I can say anything about sewing it would be: Don't be afraid to make mistakes and mess up. It is part of sewing. You will make mistakes. Guaranteed. Some projects will turn out fabulous and some projects...not so much. So, if that is what has been holding you back don't let it. We all do. I can promise even the most amazing seamstresses out there make mistakes and mess up. It is inevitable. Today I made a shirred skirt. It ended up too big. Frustrating. But, now my pregnant sister gets it. Happiness for her. I have thrown out projects before (salvaging as much as the fabric as possible). But, just like all things in life, if you keep going you end up with some amazing projects. Practise, practise, practise....keep trying. The more you do something the better you get. The same thing goes with sewing. My advice. Start small. Pick a pattern or tutorial that looks simple and easy. Straight lines are good. Not very many steps. Make a couple of them. Then move to another pattern/tutorial with a few new steps. If you cannot figure out how to do one of the steps, google it. I have learned you can find many things from google and YouTube in the sewing/craft world. They are great. 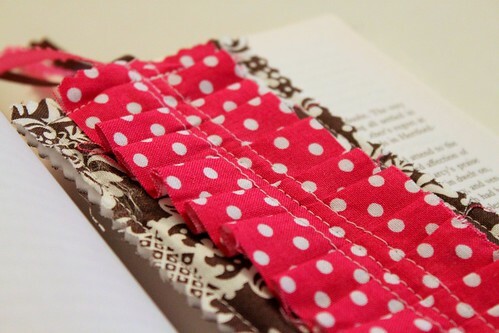 And if you want to find a quick and easy tutorial to make a bookmark I recently posted one on my blog. Straight stitching, not too many steps. And, if you mess up you didn't waste much fabric. Speaking of fabric. It is also my belief that if pick great fabrics you can make the simplest of patterns/tutorials and your end result is amazing. The Fabric Shoppe - Jody is the amazing lady behind this shop and she always gets me inspired. Always. I love her bundles. You can see some of the new and trendy fabrics in her shop. 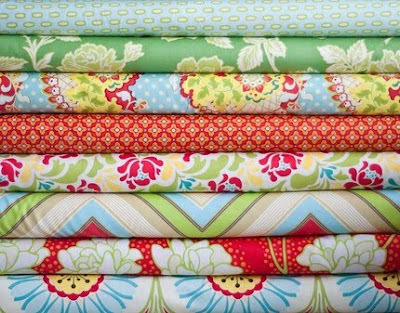 Etsy - There are so many fabulous fabric shops on etsy. When I am in need of some inspiration or new fabrics I often go and google my favorite fabric brands. I am never let down. Fabric.com - This is another place I can often find fabrics I like and get them for a little less. Especially since I get their emails with coupons. Some of my favorite fabrics come from Heather Bailey, Amy Butler, Moda, Michael Miller....I could go on. But, good fabrics really do make a difference. And of course I often end up at Joann's because it is close to my home. I hope you are feeling a little more confident to try out some new projects! Thank you Tasha for some great advice. Sewing takes daring and patience wrapped up together. Check out Tashsa's fun blog for more great ideas to grow on. Thanks for the tips totally want to learnhow to sew! Great advice! I am going to send this to my friends/family that are too afraid to start sewing. I really agree that a great fabric helps a project (and hides any imperfections!). looooooooooooooved the post! I started sewing about three months ago, and I'm still learning, the good thing is that I'm not afraid to mess up, my problem sometimes is that I pick up projects that are for an expert at sewing, but if I set my mind that I'll do it, then I will! Thanks so much for the post!!!! Great advice. Everyone messes up now and then. Always keep a seam ripper close!